The Wellington Dukes have begun the process of defending their 2018 Buckland Cup by restocking their roster in a deal with a fellow Ontario Junior Hockey League club. The club confirmed a deal that was struck today between themselves and the Aurora Tigers in a two-for-one pact that saw Wellington add a forward and some financial considerations for two pieces that contributed significantly to their post season success. Wellington will say goodbye to forward Jackson Arcan and defenceman Noah Lugli in exchange for forward Elijah Gonsalves. Arcan, a second-year Duke from Thornton, Ont. was a point-per-game player in the 2017-18 regular season , tallying 17 goals and 25 assists in 42 games. 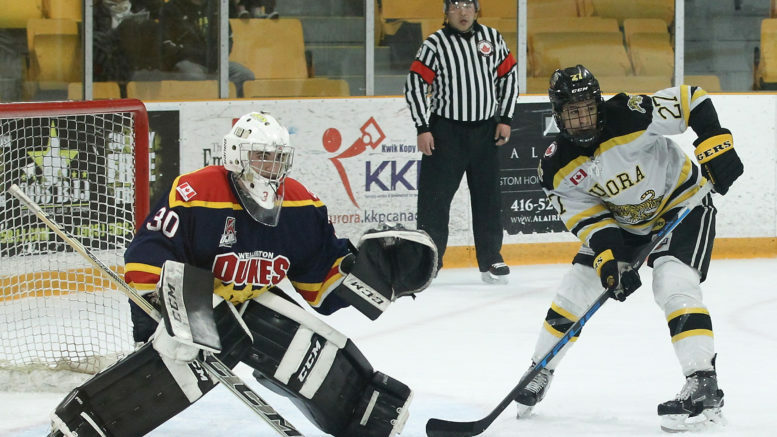 An OHL draft pick in 2015 by the Kingston Frontenacs, Arcan, 19, was one of the last remaining players inked to the program under the watch of former coach and General manager Marty Abrams. Lugli came to the Dukes mid-season last year in a deal with the Minnesota Magicians of the North American Hockey League. A hulking 6’5” 216 lbs blueliner, Lugli attended nearby St. Andrew’s College and a deal to Aurora will serve as a homecoming for the Toronto native that had five helpers in 20 games for the Dukes last season. In return, Wellington is welcoming an 18-year-old spark plug in the form of Gonsalves, a player who rarely takes a shift off and was a thorn in the side of the Dukes during the 2018 Buckland Cup semifinals. Gonsalves had 14 goals and 29 assists for 43 points in 52 games last season for the Tabbies and was the kind of get-under-your-skin player that brings added value in rivalry games or playoff contests. The Toronto native is committed to attend the Rochester Institute of Technology in 2020. Wellington will lose an up-and-coming power forward that is on the cusp of being one of the OJHL’s elite physical players that can also make plays and a huge defender that was starting to find his niche in Junior A hockey. However, Gonsalves is the youngest player in the deal and Wellington should enjoy his services for the next two seasons.